The vast majority of decent picnic baskets now come with all kinds of accessories that enhance your picnic experience. You will find for example items such as knives and forks, cups, corkscrews, salt and pepper shakers and napkins and each of these items serve a unique role in your fun day out. Perhaps the most essential pieces of equipment you will find in these sets are the picnic plates. Quality will obviously vary depending on a number of factors. These include price and materials used in the production of the plate. But at the end of the day the plate is the one item in your picnic basket that may be viewed as essential. Don’t have any knives and forks? That’s cool; we can use our fingers and pretend that we’re cavemen. What’s that, the salt and pepper shakers have been left behind? You know what I’ll just suffer through with some unseasoned food. And so on. Not having picnic plates packed though, can lead to some pretty trying situations. It may be seen as cute or romantic if you end up having to share your meal from a storage container. But if there are multiple pairs of hands rummaging around trying to find the choicest appetizer then it conjures up images of the famous urban myth involving bars and the free peanuts that are served. Picnic plates are also useful in the way they offer hassle free protection from spills and stains. The last thing you want to be getting on your beautiful picnic blanket is a great big dollop of ranch sauce that has just fallen off your buffalo wings. This invariably will happen right at the start of the picnic. Thus leaving you to watch helplessly as the stain becomes more and more rubbed in throughout the day. Saying that there is a certain need for picnic plates isn’t going to get me any Mensa invitations. But the fact remains that without this most essential and basic item in your picnic basket you will struggle to enjoy your shindig. So what kinds of plates are available to us? What are the best picnic plates to use? Are there any safety issues you should be aware of when using these plates? Thankfully (?) I’ve got you covered. Have a read on and I will tell you all. If you think that you can add to the topic then, by all means, leave your comments below and we can get a good old convo started. 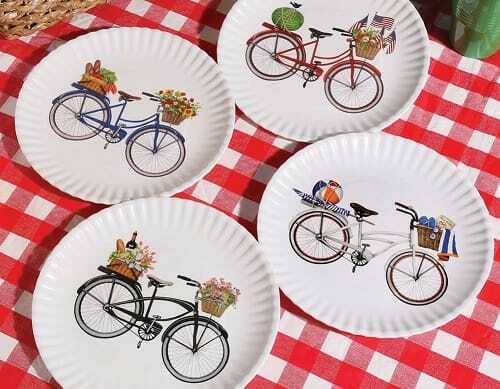 Melamine plates are by far the most commonly used form of reusable picnic plates. There’s a pretty good, and logical reason for this; melamine is inexpensive and pretty much unbreakable. It lasts an absolute age and if you suffer the curse of clumsiness or have kids who seem to like to break things just to troll you then melamine picnic plates can seem a godsend. Because Melamine is such a robust substance it means that we can easily add color to our picnic plates. This can add a sense of style to your spread. Just as a couple of quick examples I offer you this set of 4, 9-inch plates from One Hundred 80 Degrees which show some nice themed picnic drawings. Or you can try and coordinate with your picnic blanket with these Gingham plates by 180D or alternatively this lovely patchwork designed set by the same guys. The thing to take from this is that just because these plates are cheap and cheerful it doesn’t mean that you can’t style it out a little. There is a pretty important safety issue you should be aware of. These are not ceramic plates and you should never put them in a microwave, an oven or dishwashers that exceed 160 degrees Fahrenheit. Melamine is a toxic chemical that has links with outbreaks of sickness in cats and dogs and even some toddlers. There were six deaths that were attributed to elevated levels of melamine in Chinese milk formula. Theories vary on how this happened with the most plausible being it was used to boost protein readings in food which it can be mistaken for. So is melamine safe and is there anything to worry about? The answer appears to be it is safe but you need to adhere to the safety warnings. Melamine under normal conditions will not absorb into food meaning there is no transference of toxic materials. This all changes however if you heat food on melamine to temperatures over 160 degrees Fahrenheit. Food will now absorb the melamine and you will ingest it if you eat the food. Not to completely scare you off for life. This absorption is still a minuscule amount which falls thousands of times under FDA limits. So as long as you’re not nuking the life out of mac’n’cheese for days on end you really have nothing to worry about. This did start out as a bit of a scare story. But it’s better to be aware of all the facts before you make your decisions right? Whereas you can think of melamine plates as a ceramic mini-me which looks like traditional tableware, reusable plastic picnic plates just seem to shout out partyware. They are, for the vast majority, instantly recognizable for their bright, block colors and simple design. They are by and large cheaper than their melamine counterparts. And in some cases are safe to use in the microwave and dishwasher. Just be sure to check the safety warnings. You also get a bit more bang for your buck with plastic picnic plates. Melamine plates generally come in at 9-inches. You will find that the plastic versions will give you extra with 10-inches being the standard size you will find. As mentioned previously, designs are kept to a minimum which can be seen in this set by Imperial Home and this is what you will generally find when buying plastic. You can find sets that offer some nice designs by offering different looking molds like this set from WholeMarket that offers a nice triangular vortex design or this nice tempest designed set by Kreate. Disposable plates seem to get a bad rep. Maybe in the past, that reputation was correct. The impression is that they are paper products that will disintegrate at the mere touch of a warm bagel. They are seen as the lazy persons’ choice so that the washing up is a non-issue. Whilst that is not the worst thing, in my opinion, probably the most damning accusation that you can direct towards disposable plates is the huge amount of waste they produce when they are done with. 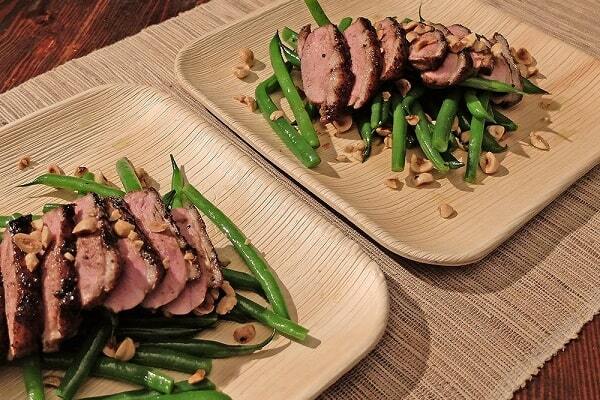 We are now thinking of disposable plates as a real option nowadays, however. And it’s due to the emergence of biodegradable products that have become more readily available to the market place. No longer do we need to be filling landfills with endless amounts of plastic and paper disposable products. We now have no excuse to think responsibly and buy products that biodegrade in a mere six months. There’s a decent selection of materials that you can get your hands on now such as bamboo which can be seen here in this pack of 10 plates by Lovely Bamboo, Palm leafs like this set from Thynk Art and Design and wheat stalk and bagasse (sugar cane) like this set from Earths Natural Alternative. Now, you will not be getting value for money when you compare prices of plastic and melamine alternatives. But I don’t think that’s the point of disposable dinnerware. You get it because you don’t want a fuss at the end of the day. You just want your day to end with no chores so you can cherish the good times. In this case, disposable plates are a great idea.